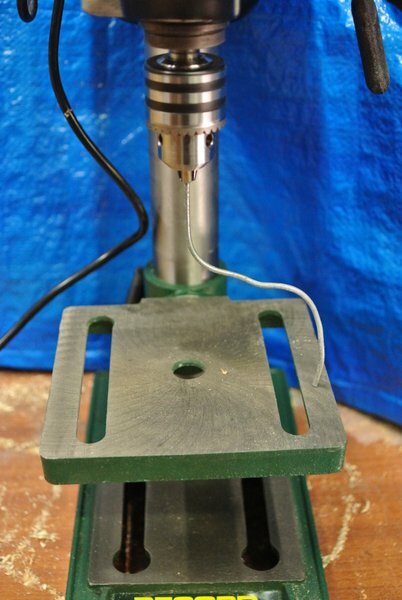 A review of the Record Power DP16B Drill Press. This is a typical generic Chinese-made 5-speed cheap drill-press. I paid £130 for mine but you can buy similar drill-presses for £70 - £90 in the UK. 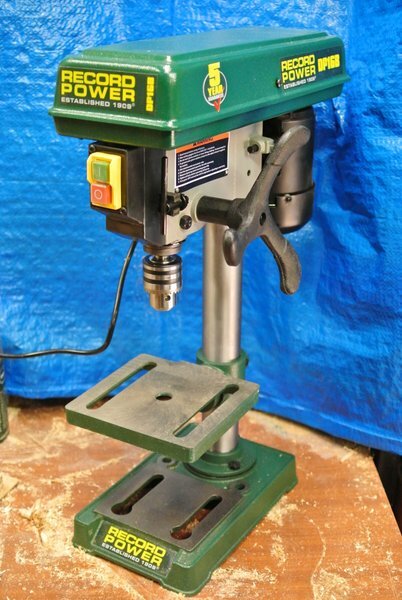 In the USA, Harbor-Freight were selling an almost identical drill-press for $68 in September 2017. I bought mine direct from Record Power expecting that it would be a bit better than the cheaper versions sold under other brand-names. Expectations shouldn’t be too high though. 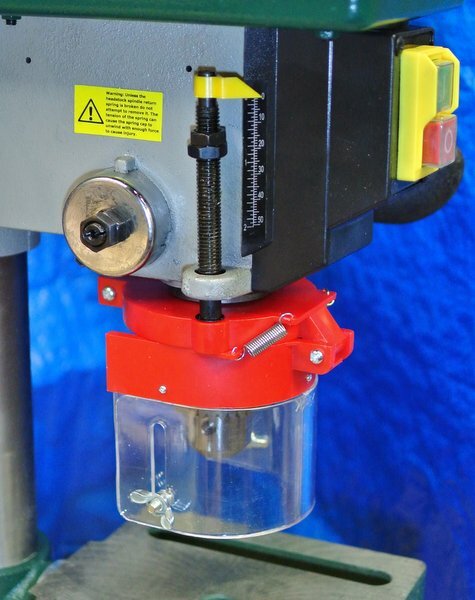 A good quality small drill-press might range in price from £250 up to thousands. Record Power are friendly and helpful on the phone. Some of the above features are not present in some of the very similar products sold using other brand names (which are otherwise almost identical). Very easy drilling with drill bits up to a 35mm Forstner bit (1 3/8"). You don’t need to exert much pressure on the handle and the holes are clean. A rubber clip holds the chuck key in a handy location. 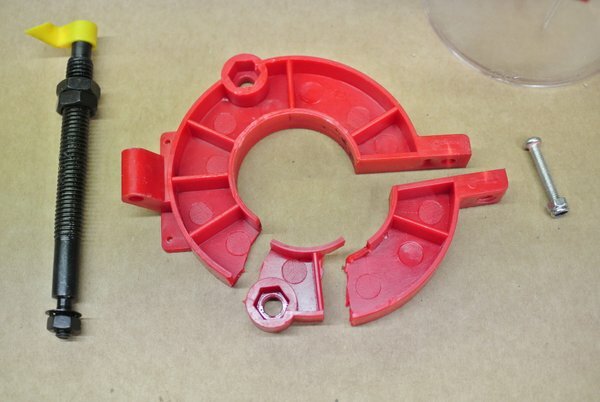 The stop-collar is made of very weak plastic and arrived split down one side. The table on mine was not flat but dished, centre was a millimeter or so low. A little more vibration than I’d hoped for, but bearable. The circular bottom-plate of the column (“support tube”) didn’t align with the raised circular area on the base. This doesn’t affect the function. Overall quality is poor to average. Manual doesn’t cover operation and hasn’t been updated. E.g. no guide for speeds vs drill-size and material. No description of purpose of some adjusters (quill play?). Good parts covered cleaning of taper & chuck. The motor retaining bolts were initially too tight to adjust belt tension. OK when loosened a little. 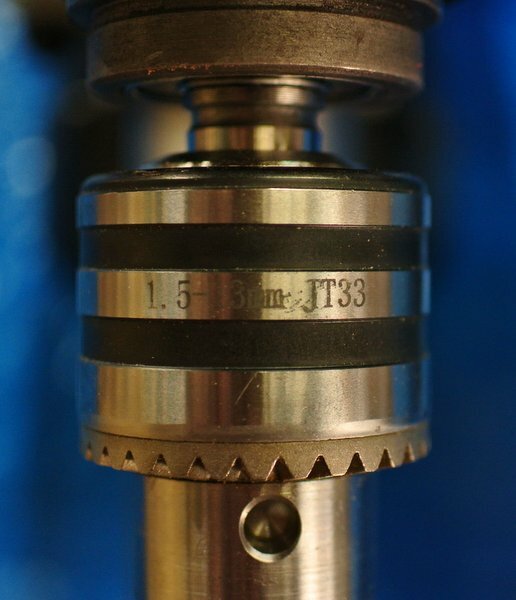 The taper is a Jacobs’ Taper number 33 (JT33). This is shown on the supplied chuck. Some promotional material says “2 Morse” but this is clearly not a Morse number 2 taper. This doesn’t really matter unless you had some Morse 2 items you’d hoped to use. This plastic is too weak and flimsy. Even if it hadn’t split, it gets in the way of removing the chuck and is not rigid enough to make a reliable mounting for the depth-stop. You won’t get consistent depths. Another problem with this collar is that it creates a Catch–22 situation where you can’t remove the collar because the chuck is in the way and you can’t remove the chuck because the collar is in the way. 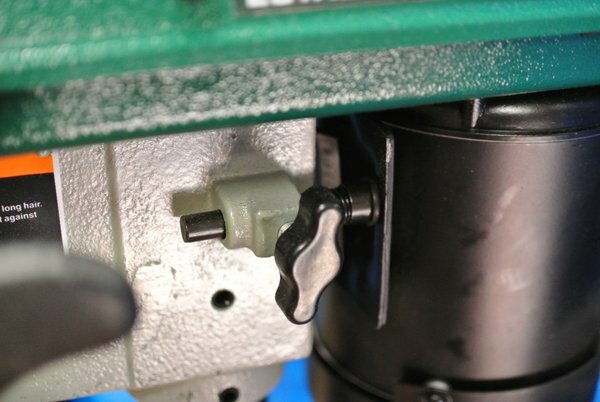 The proper way to remove a taper-fit chuck is to drive in special metal wedges between the chuck and the quill-tube. However the soft plastic collar protrudes below the quill-tube. I phoned Record Power and they sent a replacement for the broken part. Their telephone service was excellent. I’d give them 10/10. The table is not flat. 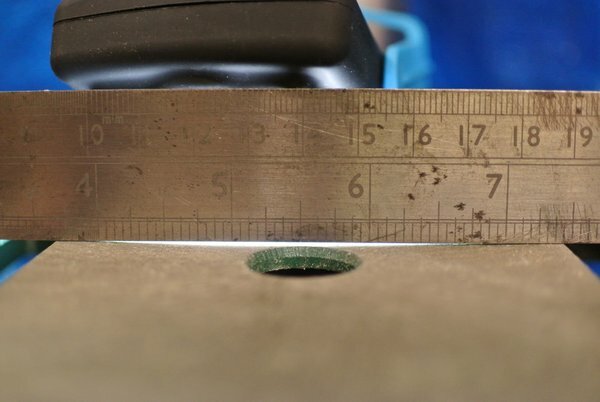 This means you can’t get it perpendicular to the drill-bit by using a square, You have to use the bent-wire technique instead. Not having a flat table is pretty bad. This one is way out of true. By rotating the chuck and measuring the clearance under the wire, you can adjust the table so it is perpendicular to the drill. Note that the supplied chuck is marked JT33. This means Jacobs Taper No 33. 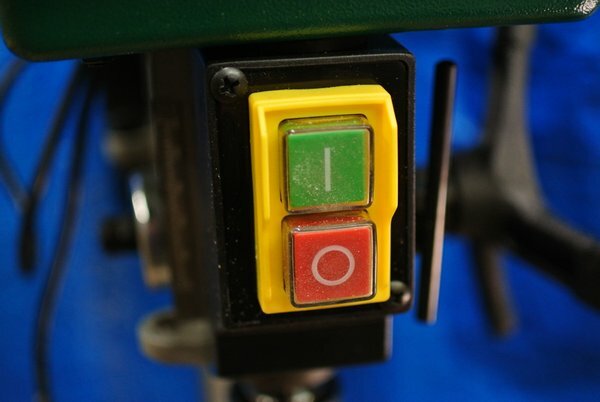 This is apparently a very common attachment standard for small drill presses. The chuck has a tapered recess in top which fits the male taper at the bottom of the spindle. This is not a Morse taper, despite what some retailers put in their descriptions. Some otherwise very similar drill-presses differ in having a top-cover with round ends. This one is rectangular. The wiring is neatly clipped in place with protective rubbery rectangles under the clips. The pulleys are not metal and may be the source of some of the overall vibration. 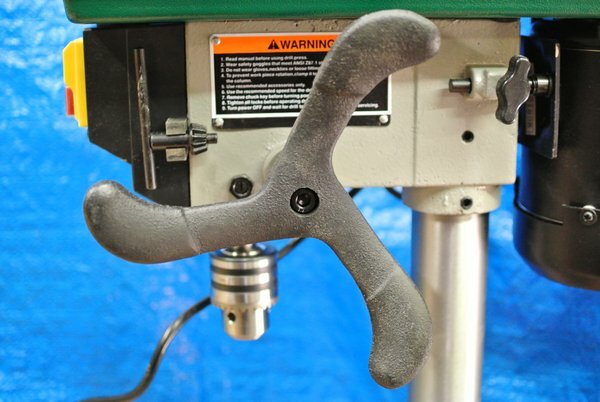 Most of the other cheap drill presses have three tubular arms that screw into a central boss. This one is cast iron. I don’t know if that makes it any better but I quite like it. Some similar drill-presses have the on-off switch at the side, it is much better at the front as here. 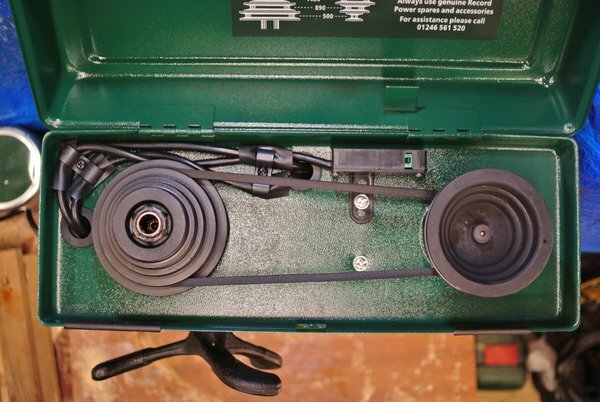 Common location for belt-tension adjuster. Note the two set-screws that lock the head onto the support column. 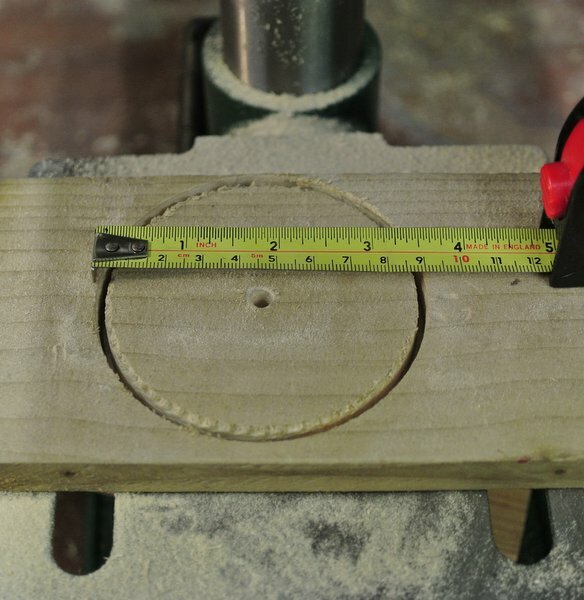 I tried making a hole with a 3.5“ hole-saw in some 5/8” pine. I had to take it very slowly and apply only the lightest pressure. Towards the end it started to bind up and stall the motor. I could finish the hole by turning the wood over and cutting the last part from the other side. This is the limits of what this machine can do. For this or larger holes, I think you need a bigger motor. I fitted the replacement collar. I took especial care not to overtighten the collar clamp-bolt. It has it’s limitations and you might not be delighted with it but it is a useful tool.